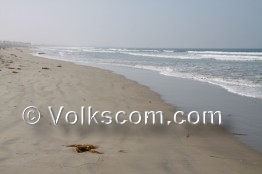 The Beaches in the Greater San Diego Area. Fig. 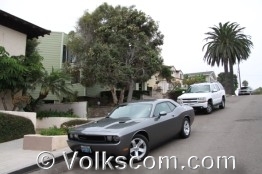 : Driving to the Southern California beaches with a Dodge Challenger. 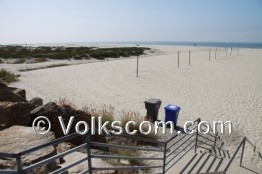 A leveled sandy beach is located at the Doheny State Beach. 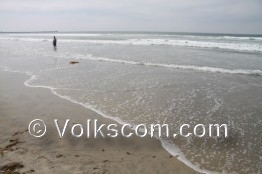 The beach at the Doheny State Beach is nice for swimming and for surfing. 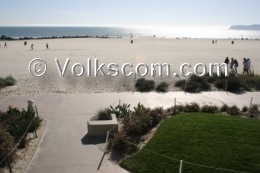 A campground is situated at the Doheny State Beach. WI-FI / WLAN is available near the snack bar. 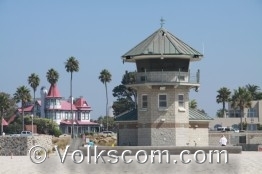 Showers and restrooms are provided at the Doheny State Beach. 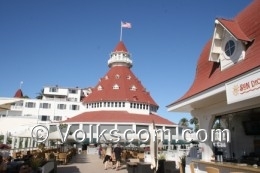 The parking fee is $15.- (as at: October 2009). 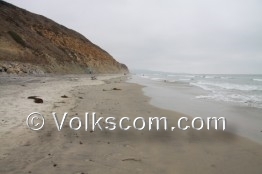 The nuclear power San Onofre Nuclear Generator Station is located between the two beaches (San Onofre Bluff and San Onofre Surf Beach). 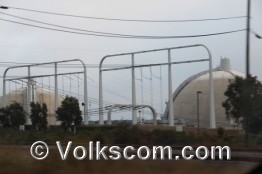 The San Onofre Nuclear Generator Station generates about 20% of Southern Californias electricity. 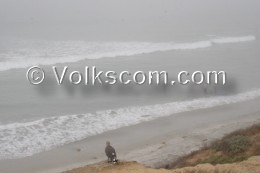 Showers, restrooms and two campgrounds are provided at the San Onofre State Beach. 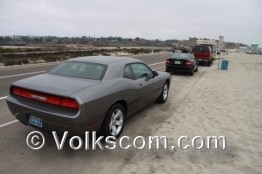 The parking fee is $15.- at the San Onofre State Beach (as at: October 2009). 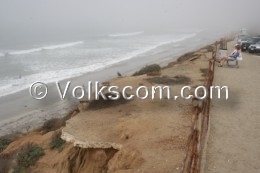 The narrow sandy beach at the city of Carlsbad is situated below a cliff. The location of this beach is not very pretty. 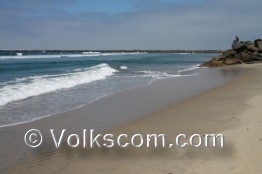 Various beaches in California are prettier than the Carlsbad Beach. 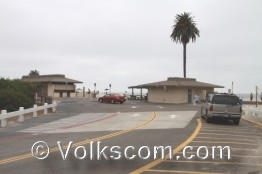 No parking fee is charged at the Carlsbad Beach (as at: September 2009). No restrooms are provided at this beach. 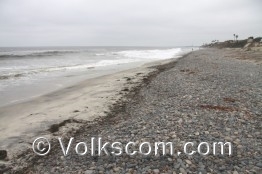 The narrow sandy beach of the Carlsbad State Beach is located at the city of Carlsbad. 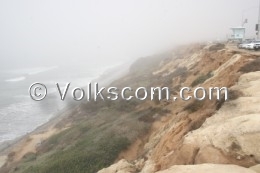 The beach is situated below a cliff. The location of this beach is not very pretty. 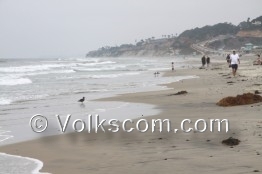 Various beaches in California are prettier than the Carlsbad State Beach. 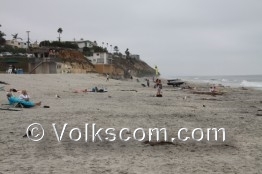 No parking fee is charged at the Carlsbad State Beach (as at September 2009). No restrooms are provided at this beach. 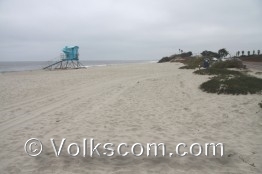 Volleyball fields and restrooms are provided at the South Carlsbad State Beach. 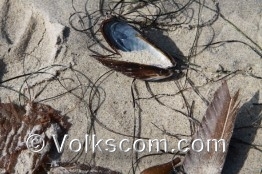 Small pebble stones and washed up parts of plants are lying in the sand. Parking is available along the roadside. No parking fee is charged (as at: September 2011). 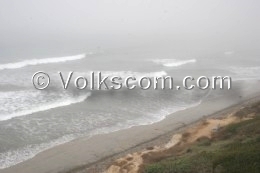 The Moonlight State Beach is run by the city of Encinitas. Washed up parts of plants are lying in the sand. 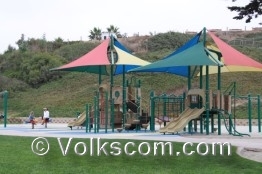 A playground, volleyball fields, showers and restrooms are provided at this beach. Limited parking spaces exists in the side roads. 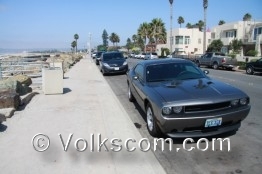 No parking fee is charged at these parking spaces (as at: September 2011). 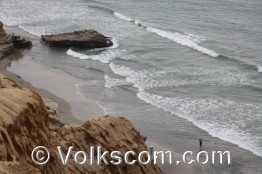 A narrow beach is located at the Torrey Pines Natural Reserve and State Beach (South Beach). Lifeguards, showers snd restrooms are provided. 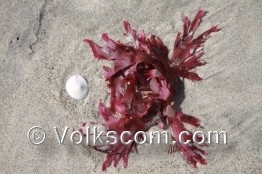 Small pebble stones and washed up parts of plants are lying in the sand. 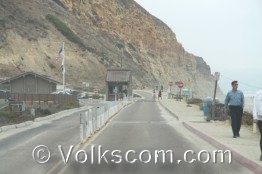 The parking fee is $10.- at the Torrey Pines Natural Reserve and State Beach (as at: September 2011). 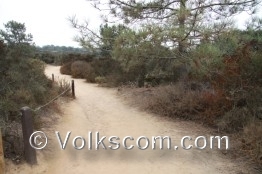 A short trail leads from the Visitor Center of the Torrey Pines Natural Reserve and State Beach to the beach at the Flat Rock. 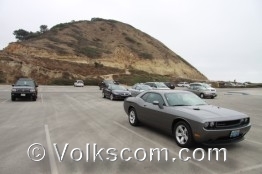 Parkingspace is limited at the Visitor Center. 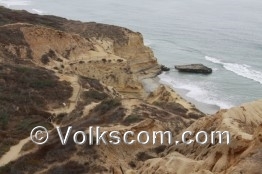 The parking fee is $10.- at the Torrey Pines Natural Reserve and State Beach (as at: September 2011). 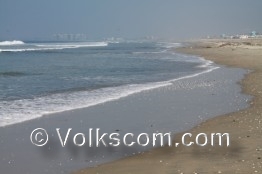 A wide sandy beach is located at the Mission Beach. 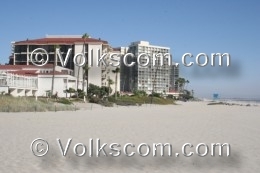 Restrooms, shops, a rollercoaster, lifeguards, rental of beach equipment, showers and restrooms are provided at this beach. Washed up parts of plants are lying in the sand. 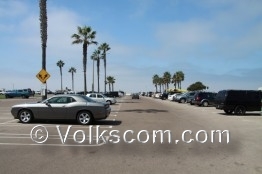 No parking fee is charged at the large parking lot at the Mission Beach (as at: September 2011). 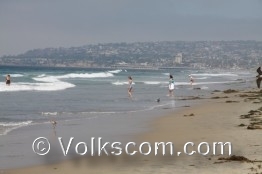 Dogs are allowed at the Dog Beach in San Diego. Because of all the unleashed dogs, it is not the best beach to spend a day at the beach. 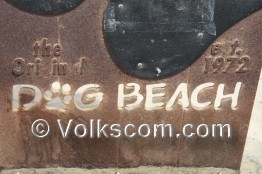 This Dog Beach was foundet in 1972 and is the oldest Dog Beach in the USA. Washed up parts of plants are lying in the sand. Two beaches exist. 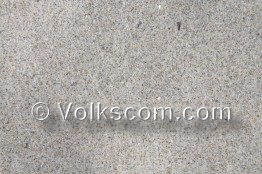 They are separated by a stonewall. 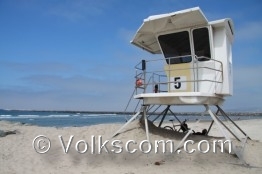 During the season, lifeguards are provided at this beach. Restrooms are located near the parking lot. Free parking is available at the large parking lot (as at: September 2011). 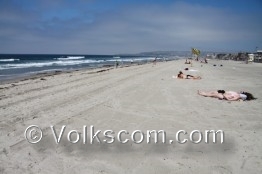 A wide sandy beach is located at the Coronado Beach. Lifeguards, volleyball fields, showers and restrooms are provided. Warning signs inform about strong currents. Washed up parts of plants are lying in the sand. Free parking is available along the roadside. 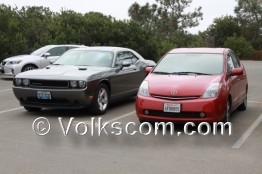 The parking space is limited (as at: September 2011). 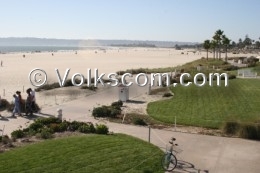 The dreambeach at the Coronado Beach is a world famous beach. 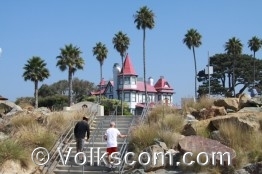 It was the filming location of the movie “some like it hot” starring Marilyn Monroe, Jack Lemmon and Tony Curtis. 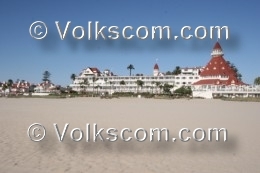 The famous Hotel Del Coronado and the beach at the hotel were used in the movie. 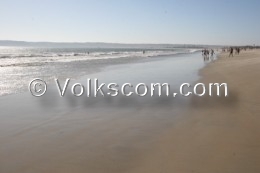 Dangerous currents are situated close to the Hotel Del Coronado. Warning signs exist at the beach. 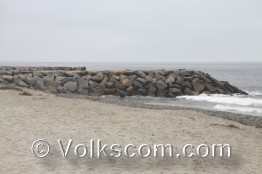 The swimming area is located at both sides of the beach. 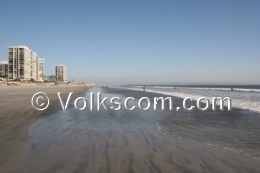 Coronado Beach is a scenic wide leveled sandy beach. Walking through the loose sand of this beach can be exhausting. 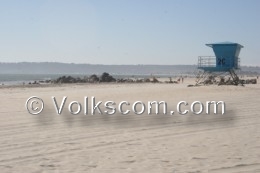 Showers and restrooms are provided at the beach at Coronado Beach (located north of the Hotel del Coronado). No parking fee is charged at the side roads (as at: September 2009). 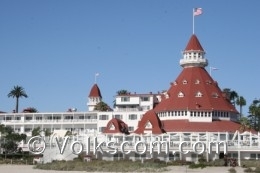 More informations about the Coronado Beach... . 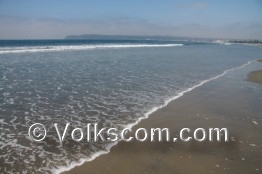 The Silver Strand Beach is located south of the city of Coronado. 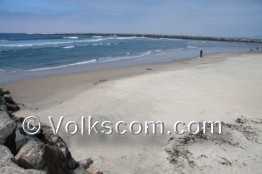 The wide leveled sandy beach is nice for swimming. 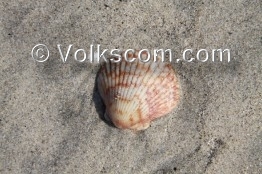 Washed up parts of plants, shells and parts of shells are lying in the sand of the beach. 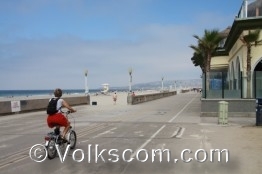 WI-FI / WLAN is available near the Lifeguard Station. 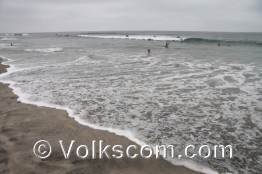 Lifeguards, Duschen und Toilettsen sind an diesem Strand vorhanden. 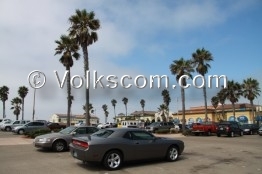 The parking fee is $10.- at the Silver Strand State Beach (as at: September 2011).